If you’re looking for a beautiful, natural wood element to add to your home, look no further. While we typically create and sell handrails for your home, we also sell railing parts, spindles, and balusters for you to use to do it yourself. Your personally made handrails will give your home an indelible mark of your own making. Mountain Laurel Handrails are shipped nationwide in easy to install sections. You can build your own personal, custom railing system using mountain laurel branches for your railing parts. Mountain laurel is a great wood to use for a branch handrail which can be installed either indoors or outdoors or both! 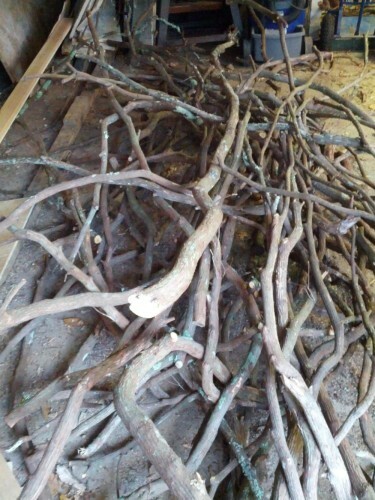 The branches are sold in bundles of 10 sticks; each stick is 8′ long. Mountain laurel branches for handrail parts are typically between 0.5″ to 1.5″ in diameter. To make your spindles or balusters, you will need to cut these to the appropriate length. You’ll need at least 12′ of stick per foot of railing. Price per bundle is $200 and shipping is additional. With this size branch, you can create a very intricate, delicate design. These look very nice on a handrail both indoors and outdoors. Indoors, the thinner branches provide a softer look and feel. The thinner intricate branch designs are also nice outdoors because they pick up the shadows and sunlight in an interesting and fun way. Even bigger than the thick branches, Mountain Laurel Handrails has available very thick logs that you can use to decorate your home. Larger diameter branches from 1.5″ to 3″ are available for when a thicker branch is desired in the weave of the rustic handrail or for staircase parts like a branch banister. Just like the thinner branches, the thicker ones work nicely both indoors and outdoors. Outdoors, in a handrail, they create a stronger and more sturdy feel. They also have a place indoors, however, as banisters for stairs or parts of furniture. For posts, mountain laurel logs are an excellent choice to complete the balustrade. Logs are available in diameters up to about 7″ for use as newel posts or staircase parts. These logs fit very nicely in places that might usually be filled with plastic or metal parts, or even more polished wood. Rather than using unnatural materials, update your home in a unique way with Mountain Laurel’s logs. Newel posts are a great conversation piece and give you the feeling of nature in your home every day. To learn more, about Mountain Laurel Handrails and available railing parts and laurel branches for sale, fill out the contact form. 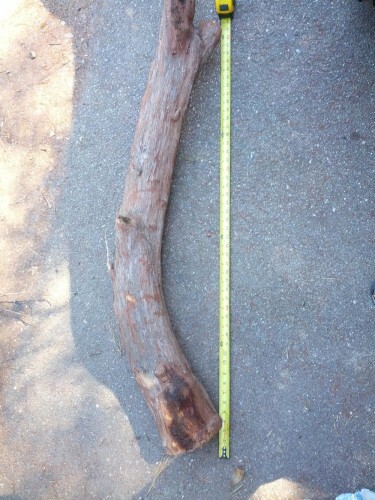 This picture shows a large diameter mountain laurel log that can be used as a newel post for staircase parts. The base is approximately 7″ at the widest point and tapers to about 5″ at what will be the top of this particular railing part. As seen in the picture above, mountain laurel material can be used as a custom newel post in deck railing systems. This picture shows a mountain laurel newel post that is 3″ to 4″ diameter. Fine woodworking skills are required to join the round branch railing material to the standard square lumber. There is really nothing like making a woven branch railing, as anyone that has will quickly affirm. It requires patience, creativity, high levels of precision with rapidly rotating saw blades, and a strong understanding of spatial dynamics needed to put together the different shapes, sizes and orientations. In other words, it’s hard work! But it makes a great amazing decoration for your home! Sometimes folks mention they like just the larger diameter sticks. You’d think that the bigger sticks would be easier since they take up more room. But what happens is that you get to a certain place, and you can’t find just the right stick that you need to curve into this spot. So you end up cutting a smaller piece into fit and so on… With the smaller sticks, you have a little more freedom since they bend just a little. So one that doesn’t fit exactly perfect can be bent into place before it’s nailed.